Do I cook often? Nope. But would I be willing to? Sure. The only problem with cooking is that usually we’d spend most of the time buying, cleaning, and preparing the ingredients than the actual cooking itself. Some might argue that the preparation of the ingredients is all part of the cooking process, but for busy (and somewhat lazy) people like myself, I do believe that it would be a lot more enjoyable for everyone if we already have all the necessary ingredients neatly displayed and arranged, and all we have to do is follow the recipe to cook the meal—which is exactly where Urban Stove comes in. 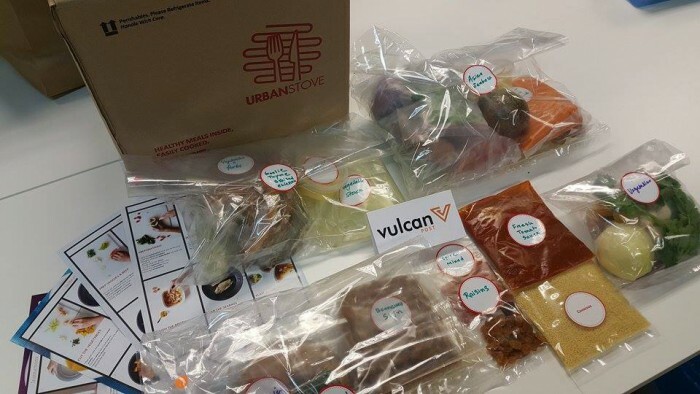 In a recent article about Urban Stove, they shared that they take care of everything that you need before cooking, such as planning the menu, doing the grocery shopping, preparing the ingredients, packing them into pre-portioned packs, and then delivering it right to you with the cooking instructions in pictorial form. Basically, they are like an overly caring mother who happens to be your kitchen helper. Also, they understand the busy schedules of working professionals, so their meals are meant to be prepared in 30 minutes. So out of curiosity, of course the team at Vulcan Post had to give this service a try. We also wanted to show off our cooking skills (not really, none of us cook much). A huge box was delivered to our office and we received four main packs of fresh ingredients, each pack had the ingredients for a meal. 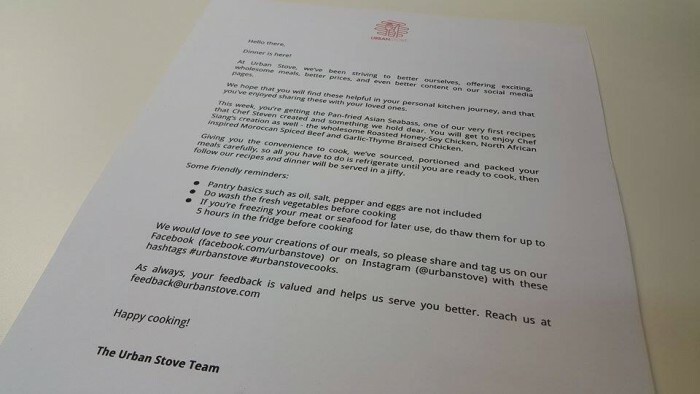 There was also a warm introductory letter from the Urban Stove team, sealed packets of sauces, and 4 pictorial recipe cards (one card per meal). 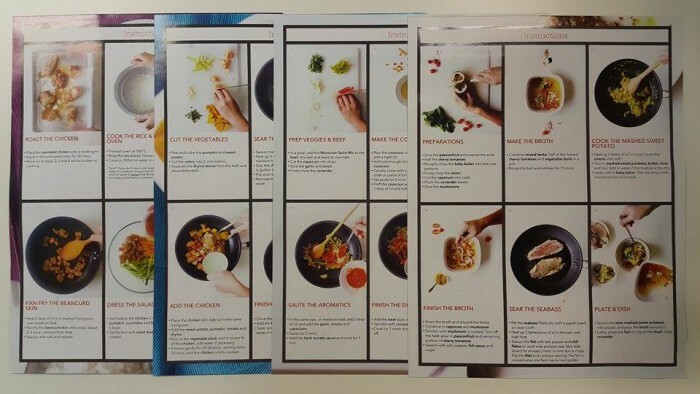 Each recipe is conveniently packed and labelled (perhaps just in case we couldn’t differentiate the sweet potato from the kailan, or the chicken from the fish). Jean personally felt a little guilty for the amount of plastic packaging that were used. Our kitchen was horribly unequipped. To be fair, it was a kitchen in a bachelor pad and the bachelor was not to be blamed. We were horrified to learn that he did not even have cooking oil, but it’s alright, we forgive him. To substitute the cooking oil, we (very creatively and smartly) used a portion of the butter that was packed for us. We decided to start with the beef first—North African inspired Moroccan Spiced Beef, because judging from the recipe, it seemed like the easiest. To say that we were unskilled might be a bit of an understatement. First, we over-boiled the couscous. Then we messed up the cooking sequence by mixing the spices and sauces too early, which was quite a major “fail” moment because we couldn’t even follow simple instructions carefully. The tomato sauce was not supposed to be mixed with the beef yet. We apologise to Gordon Ramsay. 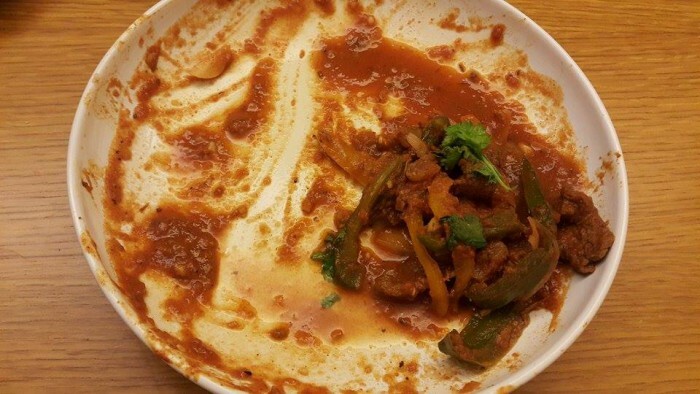 We took a whole hour to prepare this dish and because we were so hungry by the time it was done, we only remembered to take a picture as it was nearly finished. 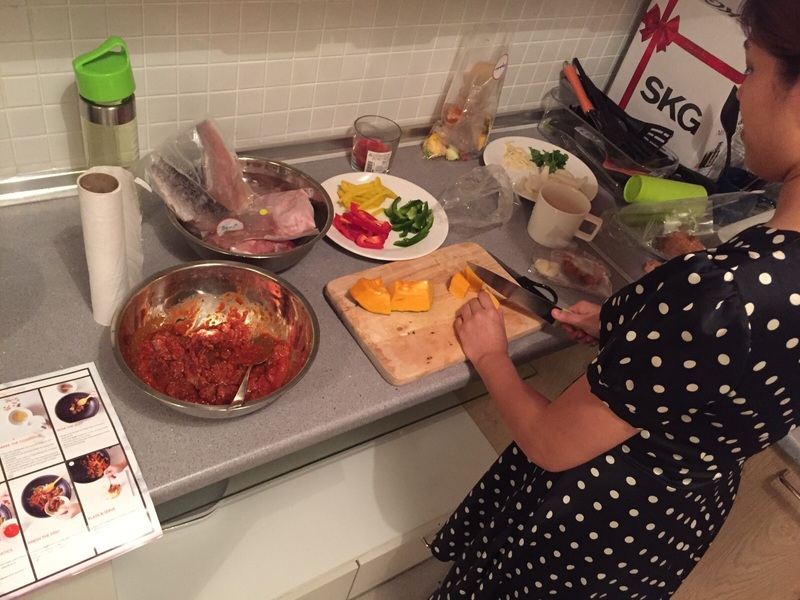 So we didn’t manage to prepare it in 30 minutes, but we thought it could be due to our lack of preparation and cooking experience. It was really yummy, either that, or we were just really hungry. The second meal was the Garlic-Thyme Braised Chicken. Learning from our mistakes in the first dish, we were more careful to follow the recipe. The dish was satisfying but even with less confusion and mistakes, we didn’t complete it in 30 minutes. We tried to shorten the cooking time but cutting the chicken into smaller parts but still we took about 50 minutes for this meal. Also the portions of sweet potato and pumpkin was kinda odd as we had way too much of the former. But that would be good news for people who love sweet potato. 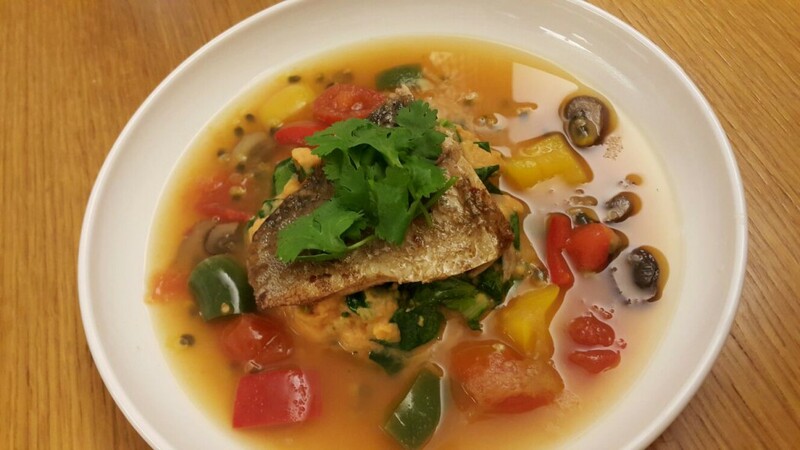 The third dish was the Pan-Fried Asian Seabass, which turned out to be our favourite. We made the least amount of mistakes with this one and worked together to be as efficient as possible but we still took a whole hour! 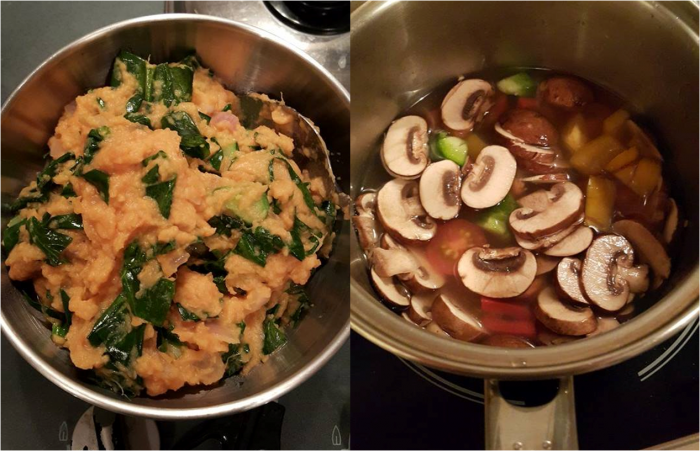 The effort was well worth it because the miso sweet potato mash was oh-so-good, albeit being a little full from the earlier two dishes, we couldn’t stop from stuffing our faces with it. The sauce was spicy and fragrant, thanks to the mixture of herbs, spices, and passionfruit. Don’t lie, I know you’d want to try this too. Unfortunately, with the amount of time already spent on these dishes, we could not prepare the fourth and final dish. So we kept the ingredients for another night. Yes, we are no Martha Stewart or Gordon Ramsay, but we were pleasantly surprised by the final product and I’m pleased to say that we had a good wholesome dinner and no one got food poisoning the next day. We did not complete any of the meals in 30 minutes, which was disappointing, because that one of our main goals when setting out to review this startup. However, even with several small mishaps, with Urban Stove’s help, the process was already simplified for us. At the end of the night, we had a good time in the kitchen and that helped us to rediscover the joys of cooking and eating together. Now it was fun and all, but the ultimate question is: Would we fork out our own money to do it again? The unanimous verdict was yes, although we agreed that it isn’t something we’d do every single day, Cedric said he’d be willing to do it three times a week, and for myself and Jean it would be a maximum of twice a week. For Urban Stove, I’d say that can be considered a win because as a startup, having returning customers is a good metric to be measuring. If you think you can do better than us noobs, you can consider giving them a try here. 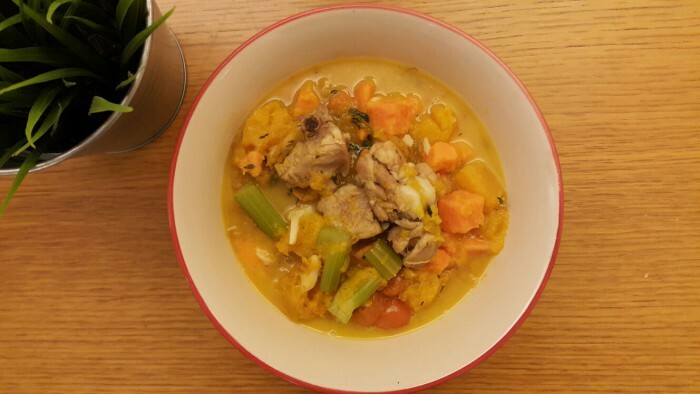 This article was written by Sarah and Jean, and we’d like to thank Cedric for generously allowing us to use his not-very-well-equipped awesome kitchen!